Trackops, LLC is a privately held company founded in 2006 out of Boulder, Colorado. Their primary product is a case management application called TrackOps that is designed to streamline the process of managing an investigation. Its features are designed to help you run your investigation business efficiently. If you run an agency with more than one employee, a product like this would be of great benefit. In this article, we’ll provide an overview of TrackOps features and pricing, explain how to sign up and how to get support if you need it. Web-Based and Mobile Access – TrackOps is a web-based software solution, so there is nothing that you need to download and install on to the computers in your office. You can access the system via a web browser or using a mobile device. And, you don’t need to worry about installing updates, patches or fixes. The version running online is always the latest version. Also, since the product is web-based, your employees and even your clients can access the information from any computer, anywhere, at anytime. When clients have access to their case information online, it cuts down on back and forth emails and phone calls, which allows you and your staff to focus on closing the case. Notifications – Various system events can be configured to send alerts via text message or email. We feel this is a helpful feature as it prompts the receiver to take action. This helps keep every case moving forward. The product’s most useful tools are its case management features. The case management tools help you make each case a single, centralized digital file that serves as a single point of truth. You can deliver documents, photos and more to clients and staff at anytime. If you have a large number of incoming cases, you understand the challenges of keeping track of who is working which case. 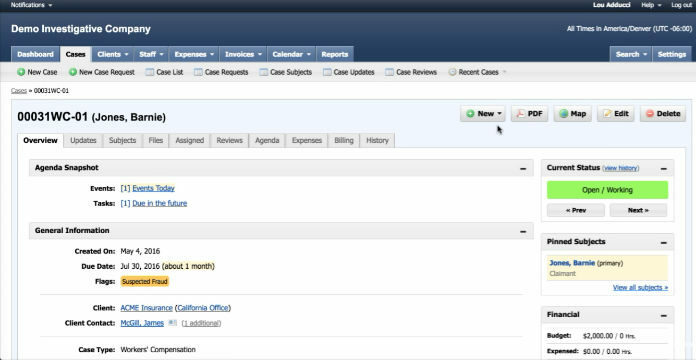 TrackOps allows you to assign cases to your investigation staff in just a few clicks. In addition, once the case is assigned, the system can generate an email or text message to notify the investigator of the assignment. This saves you time and helps you manage your caseload more efficiently and equitably. In addition to the initial case assignment, you’ll have the ability to keep track of what’s going on with every case. Every action taken on a case is logged into a searchable case history. Create Custom Forms – You can create a custom form to allow clients to submit a case request. This helps streamline the case onboarding process by ensuring you gather all of the critical information up front. Also, it allows you to evaluate the case, decide whether or not to accept it and decide who to assign it to. Import Capability – The tool helps you save time by automatically importing information from your case into documents. This reduces data entry time, cuts down on mistakes and helps you generate reports and documents in less time. A feature we love is the ability to create your own custom forms. This allows you to create a custom input form to capture information you need on a case-by-case basis. You can use the feature to create feedback forms to gather information on employee performance. The TrackOps system allows you to store and organize clients and contacts. Each client has a profile in which you can store information on their store locations, individual contacts and billing policies. Also, TrackOps lets you setup custom pricing for each clients. In addition, you can link salespeople with client cases, which helps you track sales statistics. In addition to its solid case management capabilities, TrackOps has a number of features to help you run your business more efficiently. These features help you manage employees, vendors, and more. Role-Based Access: The system uses a role-based access and permissions approach. This means that you can configure what each of your staff members has access to within the system. As an example, you can set it up so administrative staff can access certain things like contact and billing information. Then, you can set things up so the investigative staff can access the contact information, case management features, and reporting function. Then, you could give your accounting staff access to the billing functions. Of course, managers and owners would have access to everything in the system. This gives you greater , investigative staff can access others, and managers can access everything in the system. The system allows you to customize pay rates and expense reimbursements for individual employees. Also, the system also has a handy feature that will track expiration dates of employee licenses. This helps you keep your agency and investigative staff compliant and avoid expired licenses. Vendor Management: The system can be used to store information on vendors. If necessary, you can give vendors access to cases. If you’re ready to learn more and get started, visit the TrackOps website at https://www.trackops.com/. You can also contact the company via phone at 1-866-364-1420 or via email at sales@trackops.com. Their mailing address is Trackops, LLC, 1550 Larimer St. #658, Denver, CO 80202. The company also has a YouTube channel with a collection of helpful demos at https://www.youtube.com/channel/UCI5QOdelxuAYDZajIF_oJTQ.